Out of the box, the width of a mega submenu can be determined either naturally (based on the width of its contents) or set to full width. Each submenu can be sized independently. The submenu is only as wide as the items inside it. To use natural width submenus, turn on jQuery Enhancements (it’s enabled by default), and don’t check “Full Width Submenu” on your top level menu item. In other words, your submenus will be sized naturally if you don’t make any changes to the settings. A full width submenu will span the entire width of the menu bar – no more and no less. Here is an example of a full width submenu. Note that the submenu would still be that wide even if there were only two second level menu items (columns). Note that if you are using full width submenus, you can set the number of columns per row explicitly. 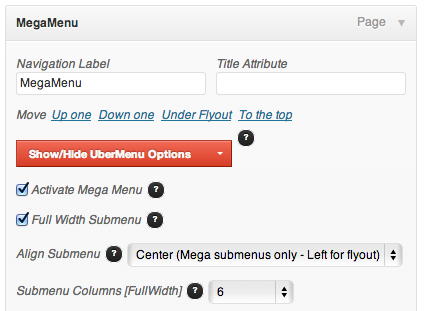 You can also set all your submenus to be full width automatically via the UberMenu Control Panel > Basic Configuration. This will override individual submenu settings. Whether you are using natural or full width submenus, your submenus will never expand beyond the width of the menu bar out of the box. Why is this? The submenu width has to be bounded somehow, otherwise it could conceivably extend beyond your content area and off the edge of the viewport, causing major user experience issues. In this case, we can explicitly set the width of the submenu to be wider than the menu bar with some custom CSS. For submenus that you’d like to expand, select Full Width Submenu on the top level menu item. Then, set the submenu alignment Right (optional, or set left depending on your situation). Alternatively, you can add media queries for various sizes and adjust the width of the submenu manually. How you accomplish this is totally up to you and dependent on your site and goals. Generally it is better to leave your submenus at flexible (non static) widths, sized to their contents, for maximum responsiveness.